It was one year ago I left my soul sucking job to follow a new path at making a life not just a living, as meager as the living I was making was. Where am I now? I wish I could say I’ve been wildly successful but I would be lying. I can honestly say that I’ve learned a lot, learned I have a lot more to learn, I’ve come a long way and have a long way to still go. One of the things I’ve learned is that the photography community is exceptionally giving and full of people wanting to share their knowledge with others. I might not have as much to share yet but this is what I can share of my journey so far. Any journey like this must start with change. Change?! It can be a scary thing for most of us. If I was going to leave the job I’d been doing for 20 years, I don’t use the word career because those are things that have personal growth and a future and mine didn’t, what was I going to do? I knew I wanted to be doing photography but I’d been doing that for years and wasn’t making any money at it. From biologist to wildlife photographer didn’t seem to be a stretch, lots of biologist took that turn but it has the added challenge of being able to find wildlife, especially the best-selling charismatic mega-verts, which there is not a lot of in a major metropolis. Just shooting intertidal invertebrates, my specialty as a marine biologist, seemed to be too small a niche to build a business around. Then one day at my soul sucking job I had an epiphany. Wildlife may be hard to find but animals are all around us, they are called pets. Being a scientist for so long means the one thing I know how to do is research and it turns out that pet photography was a small but growing segment of portrait photography. OK, that was solved, now what? More research of course. The first steps were a business name, business license, seller permit and a business bank account. All of these things vary between states, counties and cities but there are plenty of resources to help the floundering new entrepreneurs. That’s the easy stuff. The hard stuff is everything else and that is what I’m still working on and it is what you have to always be working onto keep your business moving forward. Truthfully there was more to the creation of Bark “Cheese” than an epiphany on the way to slogging through mud to change the batteries in some field equipment. 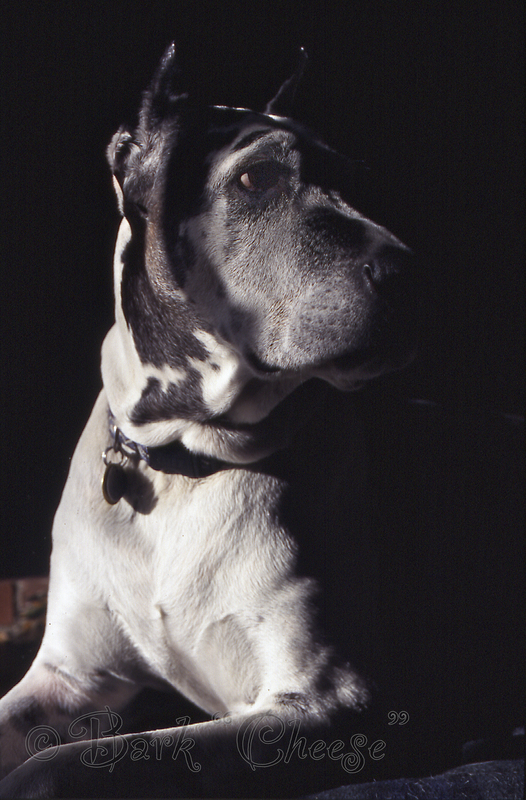 The photograph attached to this post is of my first Great Dane, Selar. She was not my first dog but she was a very special dog. I have tons of photos of her but when we had to say goodbye I realized I didn’t have a complete set of images that said “this is Selar”. Some of them expressed her character but were technically flawed and I wished for better. I want to fill that void for other people, so that they can have those memories preserved and displayed. So that is my foundation for Bark “Cheese”, to photograph not just pets but to capture the unique character of each pet. What next? Branding, it’s not just for cattle. This entry was posted in Business building, Great Danes, Pet Photography and tagged business, dog, Great Dane, Harlequin, pet portraits, photography. Bookmark the permalink. Love it! Can’t wait to hear about “Branding”!